Hey, what is OS Training and Steve Burge? 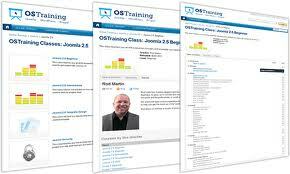 Founded by Steve Burge, OSTraining (short for Open Source Training) is one of the most successful online training companies for Joomla and other open source CMSs. Starting as an IT teacher, Steve now travels around the world teaching people how to use Open source software such as Joomla, WordPress and Drupal. He has been involved in many important Open Source projects, starting user groups and serving as a board member. Also, Steve is the author of best-seller book series “Joomla! Explained”. With your membership, you'll gain access to over 1000+ training sessions, including Joomla!, WordPress, Drupal, and coding. These high-quality video tutorials cover beginner and advanced knowledge about Template design, , security, SEO, HTML, CSS, PHP and more. If you still have questions after watching a lesson, you can contact the experts at OSTraining and a member of their staff will always help you. Still have a question about Joomla, Wordpress, Drupal…? Simply submit a request for detailed tutorial and a step-by-step written guide will be put together for you. Since all training is online, you can set your own schedule. Access the training sessions 24 hours/7 days a week. OSTraining has helped train a number of popular organizations including Apple, World Bank, Yale University, The White House, Harvard, and more. Start at $25/month for all OSTraining courses. This membership also give you access to Drupal, Wordpress, Coding, Training and support. Step 4: Making the payment using Paypal, any major debit or credit card.